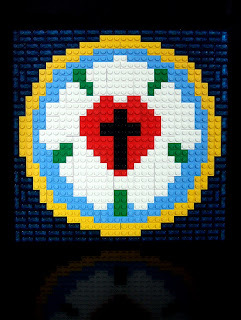 Sermon for Confirmation Sunday: "God's Own Child"
There’s a common thread woven through these readings this morning. Did you hear it? Why all this childish talk? Didn’t St. Paul teach say, “When I was a child, I spoke like a child, I thought like a child, I reasoned like a child. When I became a man, I gave up childish ways.” And now you’re telling me to become like a child? Which is it? Give up my childish ways or become like a child? In good Lutheran fashion, the answer is yes. Repentance is a call to give up our childish ways of selfishness, stubbornness, and foolish attempts to save ourselves. And to become like a child is to look to God as Father, dependent upon his mercy, grace, and steadfast love in everything. What does it mean to be God’s child? It means that God has made me and all creatures; that He has given me my body and soul, eyes, ears, and all my members, my reason and all my senses, and still takes care of them; that he daily and richly provides me all that I need for this body and life; that he guards and protects me from all evil…all out of his fatherly, divine goodness and mercy, without any merit or worthiness in me. To be God’s own child means that God has redeemed me a lost and condemned person, purchased and won me from all sins, from death, and from the power of the devil; not with gold or silver, but with his holy precious blood and his innocent suffering and death, that I may be his own and live under him in his kingdom and serve him in everlasting righteousness, innocence, and blessedness. To be God’s own child is to believe that I cannot by my own reason or strength believe in Jesus Christ, my Lord, or come to him; but the Holy Spirit has called me by the Gospel, enlightened me with his gifts, sanctified, and kept me in the true faith. To be God’s own child is to rejoice in Jesus who became a little child for each of us so that he could put away all our childish sinful ways of selfishness, stubbornness, and sin forever, and make us his beloved children. Behold what manner of love the Father has given unto us, that we should be called children of God…and so you are. And so it is the vocation of children to receive: clothing, shoes, house, home, and the like, as we hear in the first article of the Creed. 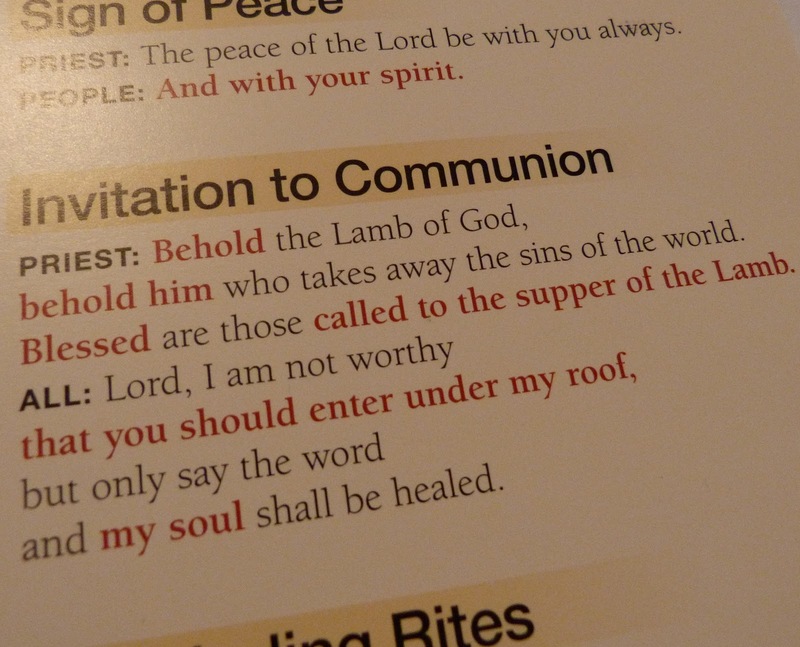 And to receive our life in Christ as well: food for body and soul in the Lord’s Supper. Words in our ears and that set us free from our old childish ways. Holy Baptism that makes us heirs of heaven. 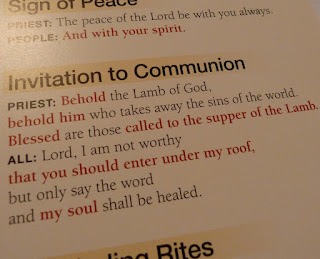 Holy Absolution that constantly reassures us: you are forgiven; you’re a member of the family. And if it is the vocation of children to receive, it is also the vocation of parents to give, nurture, and teach, as the Lord instructed Moses. We do this at church to be sure, but also in our homes, on vacation, or in the car. It’s why we have a catechism class, examinations, and a confirmation Sunday. Of course, we don’t do any of these things today to become God’s own children. We do them as a way of confessing who we already are in Jesus: God’s own child, I gladly say it. I am baptized into Christ! Sermon for Pentecost 2: "Jesus and the Centurion"
At first this story seems like many of Jesus’ other miracles. There’s a servant who was sick, and at the point of death. The reports of Jesus’ teaching and healing had spread like a viral YouTube video. But now Jesus was back in Capernaum. There’s hope for this deathly ill servant. Messengers are sent. Jesus listens. Jesus speaks and the servant is healed. Yes, at first this story might appear to be one of many miracles Jesus performed. We’ve heard it so many times that we forget to stop, slow down, and listen to each story carefully in detail. It’s easy to get lost in the familiarity of Jesus’ teaching and miracles. How quickly we hear without listening and read without seeing. This is a story about Jesus healing a sick servant, and yet it is more than that. This is a story about the faith of a Roman centurion, and yet it is more than that too. 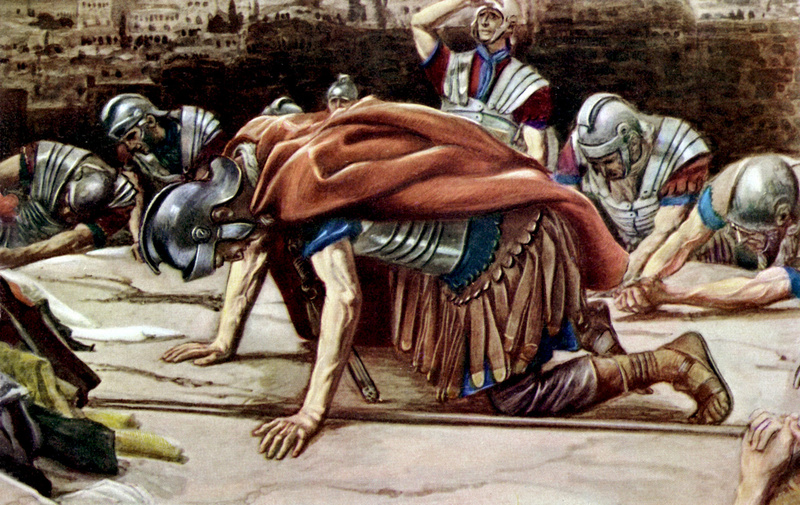 Jesus’ healing of the centurion’s servant is a series of unexpected events. And we see this right from the beginning of the story. Now a centurion had a servant who was sick and at the point of death, who was highly valued by him. When the centurion heard about Jesus, he sent to him elders of the Jews, asking him to come and heal his servant. Let these verses sink in a minute. The Romans thought Jews (and later, the Christians) to be nothing but a bunch of superstitious, religious zealots. And the Jews considered the Romans unclean, Gentiles and outsiders. And yet here’s a Gentile Roman centurion sending Jewish leaders to a Jewish Rabbi to heal his servant. He heard the reports about Jesus’ healings and teachings. Staring death in the face, he knows Jesus is the only one with the authority to do something about it. As Jesus later points out, the centurion’s faith is also unexpected; he’s not your average Gentile. It’s all the more unexpected because the Jewish leaders are the ones talking this Roman centurion’s credentials up before Jesus. He’s worthy to have you do this for him, they say. He loves our nation. He built our synagogue. This is what we expect from religion: Let’s make a deal with God. We do our best and God will do the rest. Ask the average person in a man-on-the-street interview about what makes someone worthy for forgiveness, life, and salvation, and I expect that most of the time you’ll hear: “I’m basically a good person. I try to be nice to others. I’m not perfect, but at least I haven’t murdered anyone.” That’s how one is worthy in the eyes of the world: what you do or don’t do. Sadly, this kind of thinking works it way into our Christian lives as well. If only I set aside more time to read the Bible, pray, and diligently follow my daily devotions, I would be worthy. If I gave more of my time and offerings to the congregation, then I would be worthy. If my faith was like the Roman centurion’s then I would be worthy too. Do you see the trap that is set before us here? It’s not that any of these things are bad. Quite the opposite actually. Daily prayer, devotions, and Scripture reading are good. God’s Word is our life just as gave life to the Centurion and his servant. Our stewardship of time and earthly possessions are also good. But it’s always done in response to what God has given us first. The Jewish leaders thought that the Roman Centurion was worthy because he was so compassionate, generous, and loving. Rather, he was generous and loving because he knew he was unworthy and his worthiness was in Christ. It’s the same for us too. We love and serve others because Christ first loved and served us by laying down his life for us. Our worthiness is in Christ crucified and risen for us. Notice that Jesus doesn’t praise the centurion’s worthiness. He doesn’t even pay attention to the Jewish leaders’ gushing praise for the centurion. Jesus simply goes on to the Centurion’s home where the story takes another unexpected turn. As Jesus approaches the Centurion’s house, the centurion sent friends, saying to him, Lord, do not trouble yourself, for I am not worthy to have you come under my roof.7 Therefore I did not presume to come to you. Here was a Roman’s Roman, a commander of 100 in Caesar’s army. A man of Strength. Honor. Integrity. He cared for his household and community. He was a Roman officer and a gentleman. If anyone was worthy to have their request for healing met, it was this guy. That’s what we, along with the Jewish leaders expect. But, then to our surprise, what does he say? I am not worthy. The centurion confesses his own unworthiness. He didn’t cling to any worth of his own. He looked to Jesus and his Word. And ironically, this Gentile in all his unworthiness sees more clearly than any of Jesus’ own people what kind of Savior he is. The centurion knew he was in need, knew he was unworthy, and believed that even though he had no claim on Jesus, Jesus was the one who would rescue, save, and heal both his servant and him. And so he does for you too. This kind of faith is also unexpected. What makes us worthy along with the centurion? Knowing that our worthiness is found in Christ alone. Like the centurion, Christ declares us who were unworthy to be worthy. You are counted worthy by the blood of the Lamb, worthy by his death and resurrection, worthy in baptism, worthy guests at the Lord’s Supper. Jesus says the word and you are worthy. Along with the Roman centurion, we cling to Jesus’ Word. This man recognized that Jesus was also a man under authority. The Father said, “Go.” And Jesus came; He was born for you. Kept the Law that declares us unworthy for you. He was crucified for you. He rose from the dead for you. Unexpected to be sure, but this is how Jesus makes you worthy. Jesus does all everything to rescue and heal you and then gives you the credit, just like the centurion. It’s not at all what we would expect, it’s not even what we deserve, but it’s exactly what Jesus has done for you. Like the Roman centurion your faith is great in Christ, you are healed by his Word, and you are worthy in Christ.